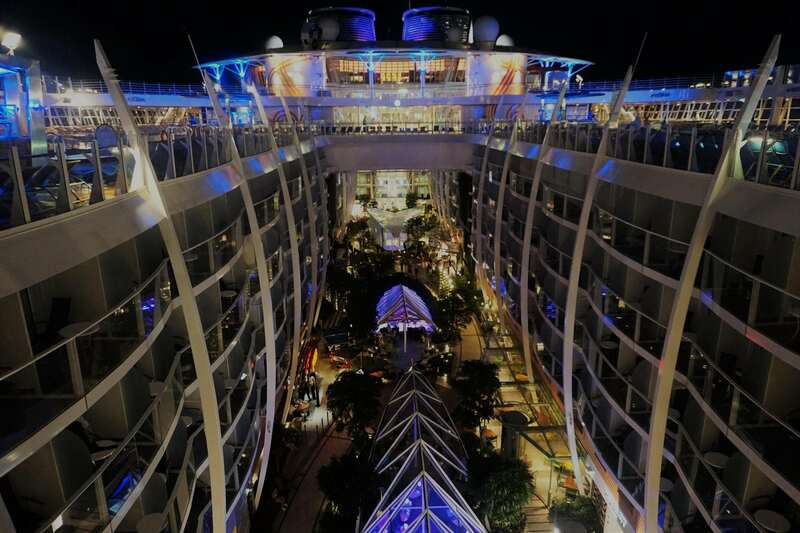 Harmony of the Seas, Royal Caribbean International’s newest ship, is in a league all of her own. 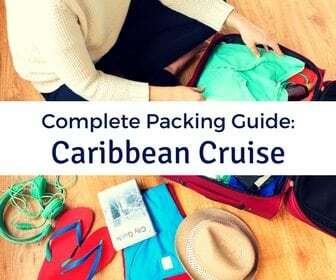 This largest cruise ship to date offers plenty of onboard activities for all types of cruisers. 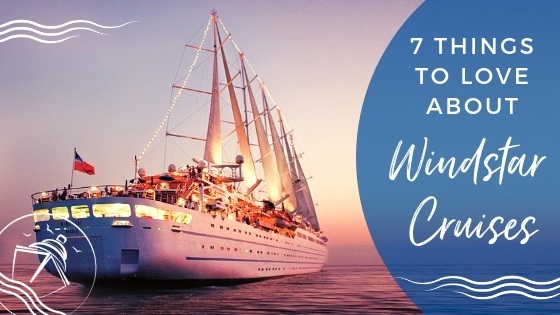 With such a plethora of offerings, how will you decide what you want to accomplish during your seven days onboard? Well, we are here to help. 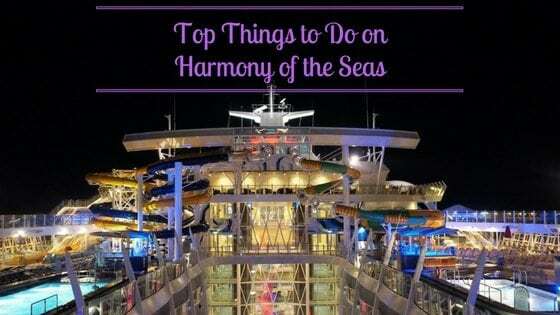 After just returning from a cruise on this mega-ship, we have come up with our list of the Top Things to Do on Harmony of the Seas. 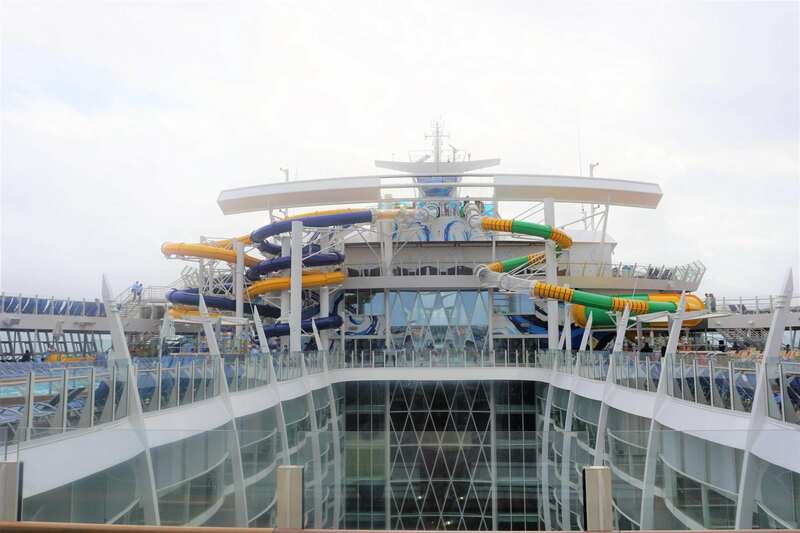 Making a debut on Liberty of the Seas, Royal Caribbean is hopping on the waterslide bandwagon. Offering the first waterslides on an Oasis class ship, Harmony of the Seas serves up the Perfect Storm. This trio of waterslides, the Typhoon, the Cyclone, and Supercell, are sure to provide some wet and wild fun. Whether you choose to swirl around in the Champagne bowl slide or whiz down the dual racer slides, you are bound to have a swimmingly good time. 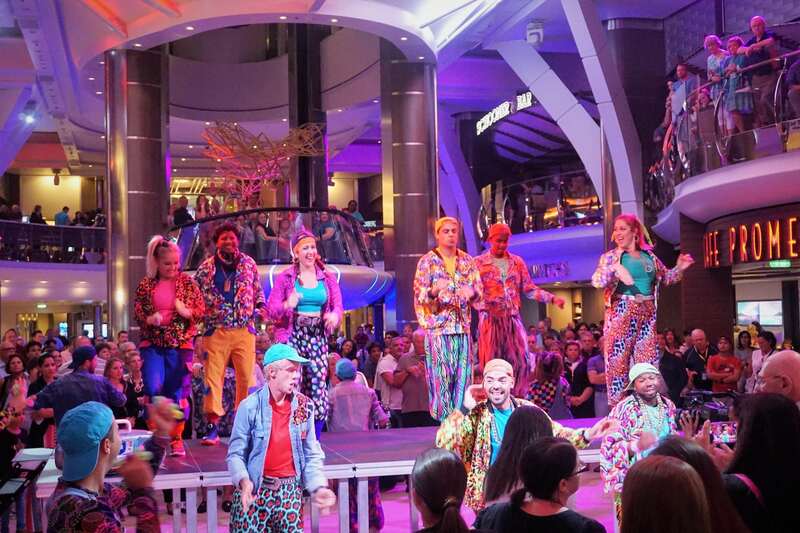 In an attempt to appeal to a somewhat younger demographic, Royal Caribbean has rolled out a 90’s Party replacing the 70’s Party that occurs on the Royal Promenade. Bell bottoms and disco balls give way to hammer pants and boom boxes in this one of a kind party. With popular hits from our younger years, we certainly welcomed the change. Stake out some prime real estate for this not to be missed party occurring on Day 6 of our cruise. Although Starbucks kiosks are also on Oasis of the Seas and Allure of the Seas, new to Harmony of the Seas is the location of this popular coffee chain. 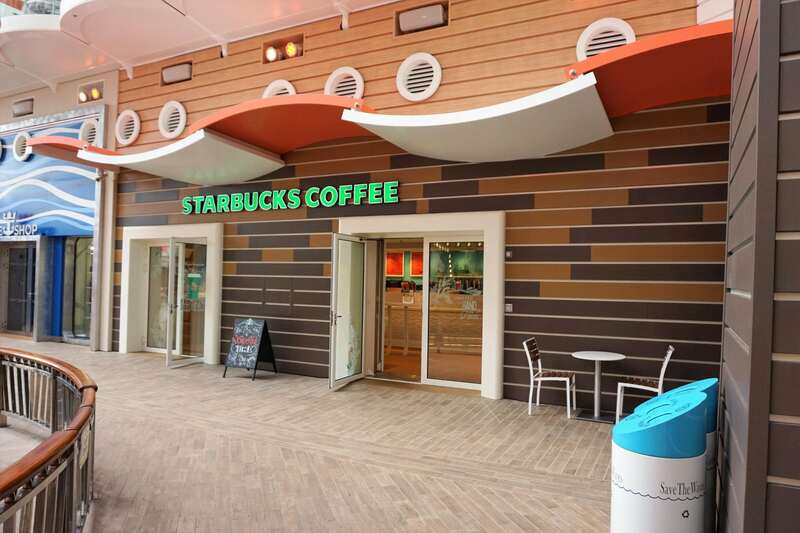 On Harmony of the Seas, Starbucks is located on the Boardwalk and offers more of a traditional coffee shop set-up with both indoor and outdoor seating. There’s no better way to spend your morning than sipping an iced caramel macchiato in the Caribbean sun while relaxing on the Boardwalk. Additional charges do apply. Making its first appearance on Quantum of the Seas, Harmony of the Seas features the first two story Wonderland restaurant. Venture down the rabbit hole into this Alice in Wonderland inspired venue. 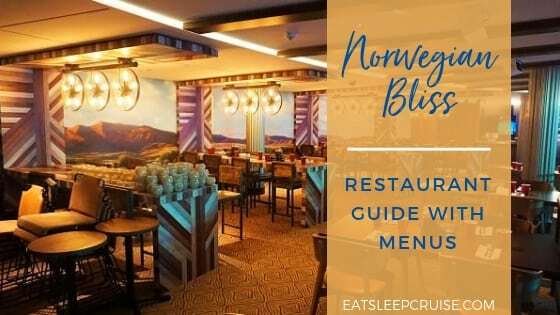 With an imaginative menu, along with equally unique decor, this restaurant is unlike anything you have experienced before. Step out of your comfort zone and get creative with your menu selections; you only live once! 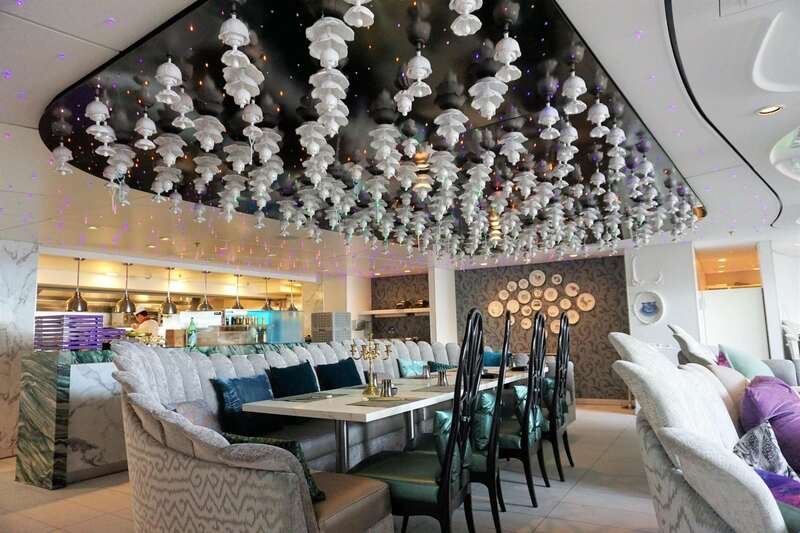 In our opinion, dining at Wonderland is definitely one of the Top Things to Do on Harmony of the Seas. 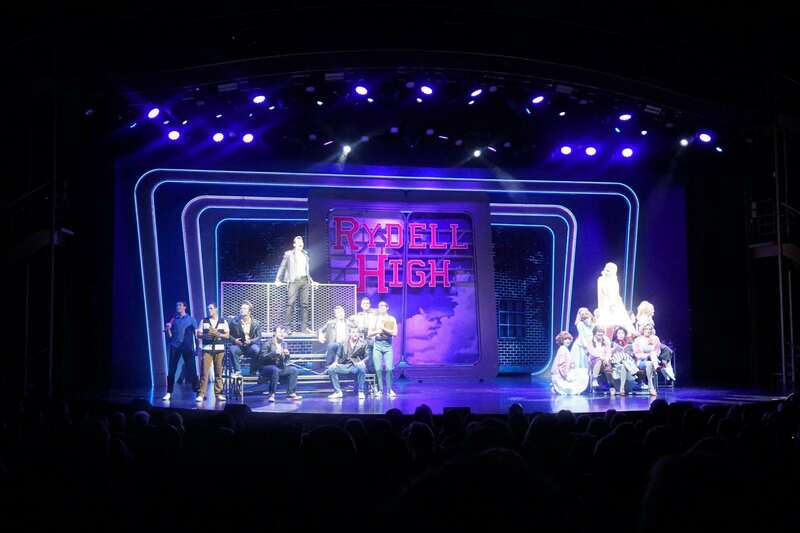 Grab your leather jacket and poodle skirt, then head to the main theater for the hit Broadway musical, Grease. Follow Sandy and Danny’s romance in this upbeat 90 minute performance. For those “Summer Nights” in the Caribbean, “Grease is the Word”. 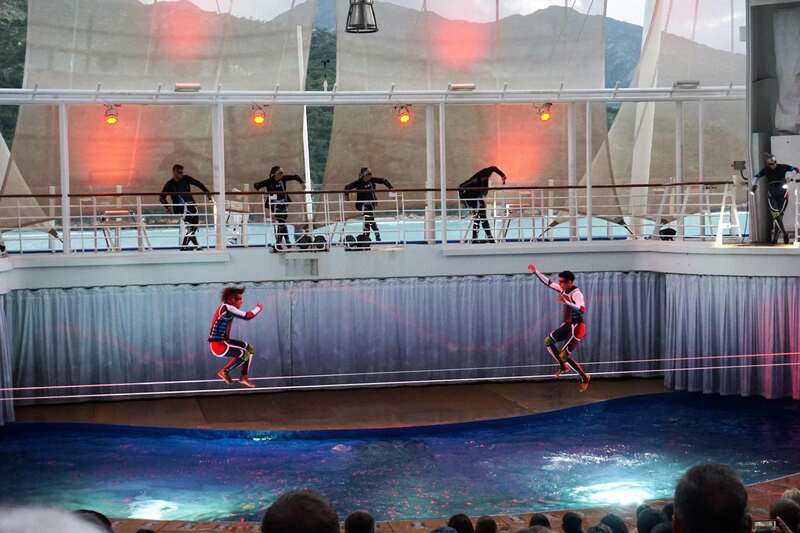 If that’s not enough, Harmony of the Seas also offers Columbus the Musical!, a comedic Royal Caribbean production, ice skating shows in Studio B, diving shows in the Aqua Theater, and so much more entertainment. 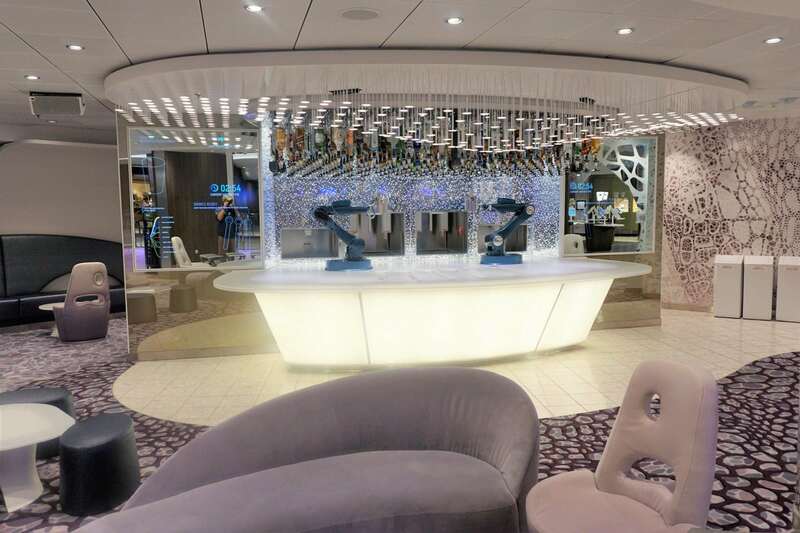 Also on Quantum class ships, the Bionic Bar is serving up your favorite cocktails on Harmony of the Seas. Select a pre-made cocktail or design your own concoction, place an order, and pay all on an electronic tablet. (Note: these drinks are covered in the Deluxe Drink Package). Now the real fun begins as you get to watch your drink being made by a robot. 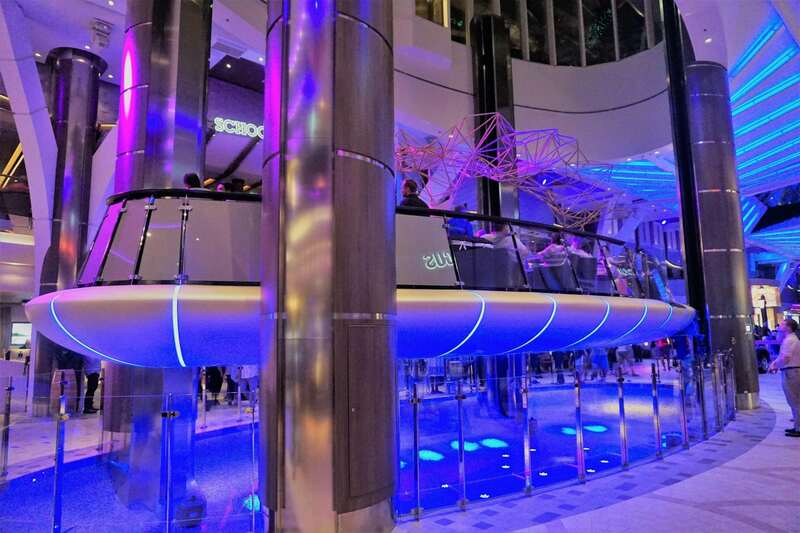 Truly “mixology meets technology”, the Bionic Bar is definitely something you should experience at least once on Harmony of the Seas. 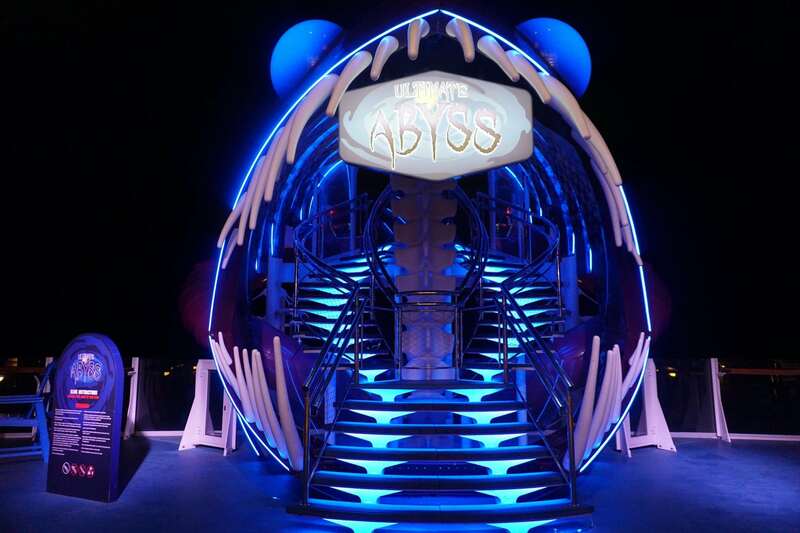 A first of its kind on any cruise ship and the tallest slide at sea, the Ultimate Abyss has debuted on Harmony of the Seas. This 10 story slide towers 150 feet above sea level, twisting and turning its way down to the Boardwalk. Brave the glass launching platform, take a seat on your riding mat, and enjoy the ride complete with visual and audio effects. Admittedly, the entrance is the scariest part of the slide, so don’t let all the hype scare you away from trying this novelty experience. 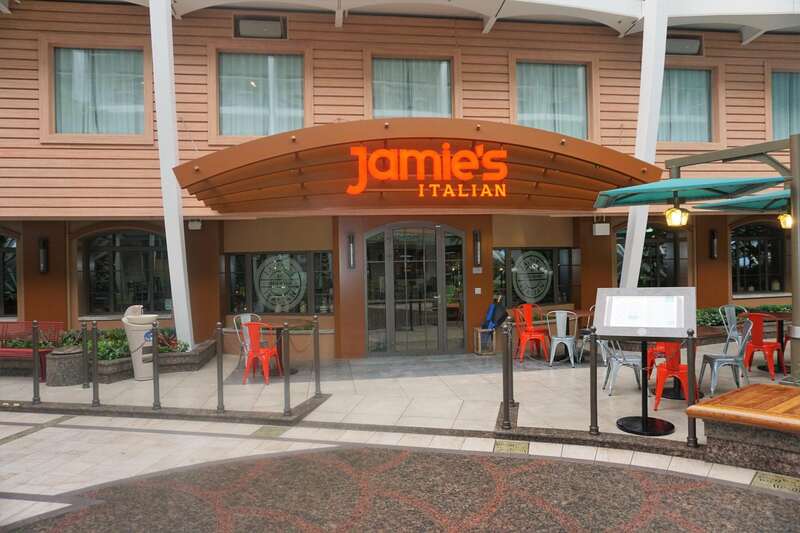 Making a debut on its first Oasis class ship, Jamie’s Italian serves up some fabulous food, not to mention views, in Central Park on Harmony of the Seas (taking the place of Giovanni’s Table). Jamie’s Italian, a partnership with Royal Caribbean and celebrity chef Jamie Oliver, offers authentic Italian fare in a casual atmosphere. With homemade pasta, meat and cheese planks, and a one of a kind menu, you might just want to order one of everything! No matter what you decide to order, Jamie’s Italian is sure to please your palette. On Harmony of the Seas, there will be plenty of photo-ops for you to take a selfie with your favorite characters from popular Dreamworks movies including Shrek and Madagascar. Get ready to pose with Princess Fiona, Puss in Boots, or Gloria from Madagascar in a variety of locations around the ship. 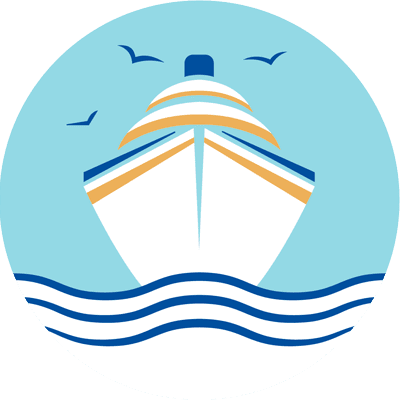 Check your cruise compass for times and locations. 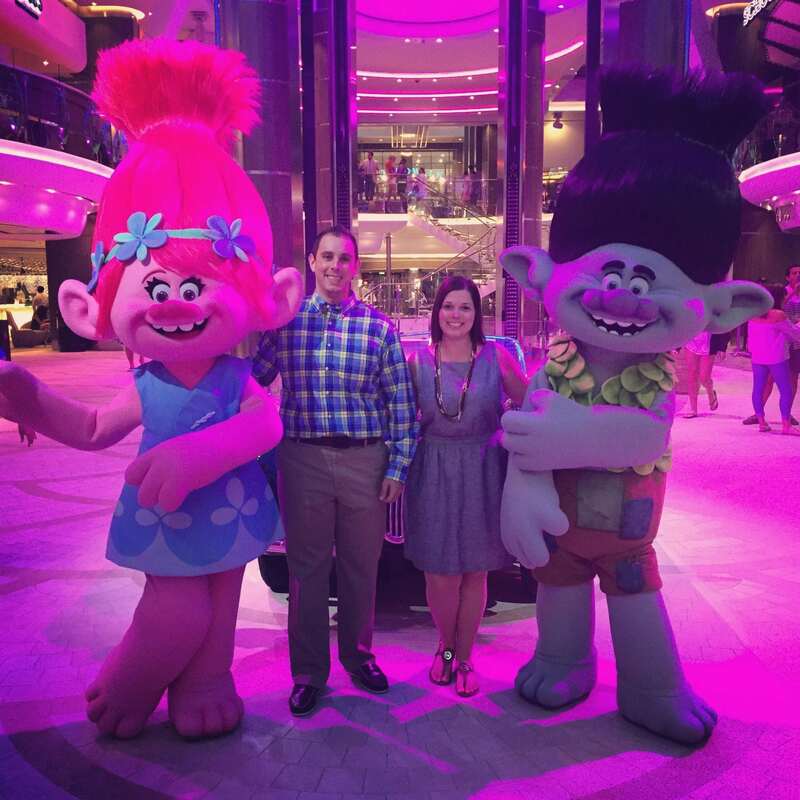 New on Harmony of the Seas, you might just find some Trolls from the new hit movie. Too bad it’s not really Justin Timberlake under the costume! Like Oasis of the Seas and Allure of the Seas, Harmony of the Seas also boasts the unique Rising Tide Bar. This spaceship-like bar rides up and down 3 stories from the Royal Promenade to Central Park. Step inside, order a specialty cocktail, then sit back and enjoy the great aerial view of the Promenade. 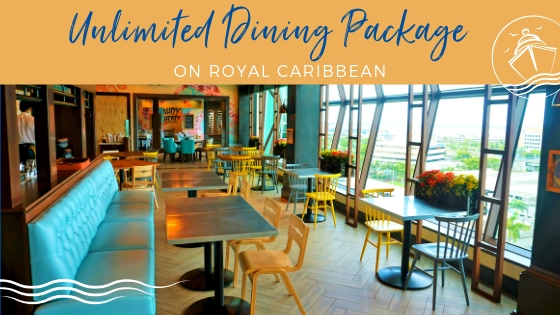 Seating is limited in this venue, and it only runs at set intervals during the evening, so be sure to set aside some time to go for a ride in the Rising Tide Bar on Harmony of the Seas. 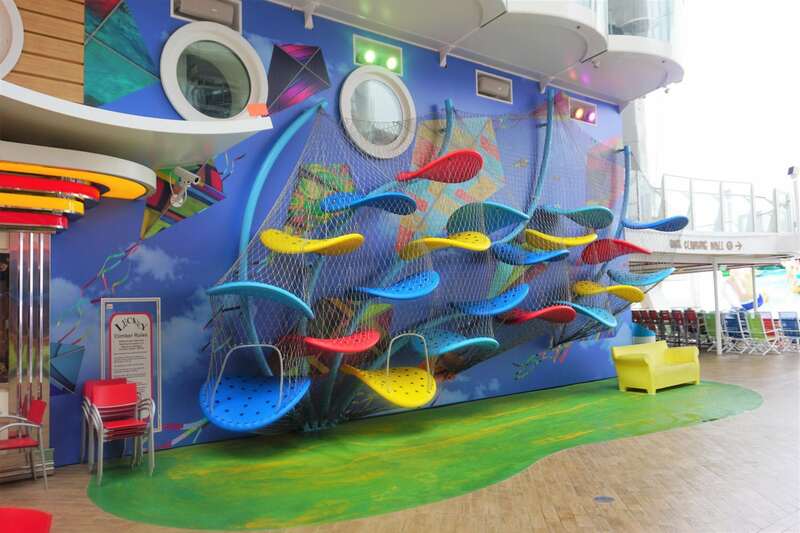 Located in the Boardwalk on Harmony of the Seas, Luckey Climber is another unique feature to the ship. This large jungle gym of sorts is surrounded by a net, allowing the kids to climb until their hearts are content while you have some peace of mind knowing that they are safe. These three dimensional sculptures not only provide hours of fun and physical activity, but they are also works of art. Luckey Climbers can also be found on land at multiple locations in the United States, Europe, and Asia. Central Park, nestled in the middle of deck 8, is certainly one of our favorite locations on Harmony of the Seas. With its lush greenery and tranquil vibe, it’s a great spot to spend an evening. Dine al fresco at one of the many specialty restaurants here or just grab a drink from the Trellis Bar and relax under the stars. You could even take it one step further and book a Central Park view balcony. Then you could spend the whole night, quite literally. This unique neighborhood balcony even offers a few additional perks for booking. 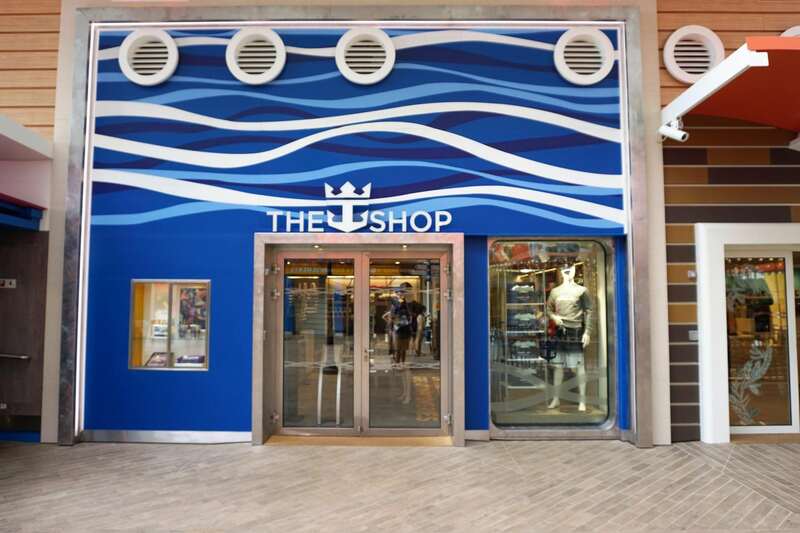 Whether you are in the market for some logo merchandise, some duty free liquor, perfume, watches, or handbags, Harmony of the Seas offers plenty of shopping choices. With high end luxury brands such as Regalia, Cartier, Hublot, Kate Spade, and more, you better win big in the casino if you want to return home with some new bling. If that’s not enough, there is also an art gallery that offers auctions throughout the cruise. We better just stick to the $10 t-shirt sale! The Aqua Theater on Harmony of the Seas takes entertainment to new heights in 2 brand new shows, The Fine Line and Hideaway Heist. This unique outdoor venue located in the Boardwalk is the perfect spot to incorporate high wire and diving acts into these captivating performances. The Fine Line is available for pre-booking in your cruise planner, and we highly recommend doing so as shows book up quickly once onboard. Unfortunately, these shows are weather dependent, but as long as Mother Nature allows, do not miss The Fine Line. This newest escape room experience on Harmony of the Seas is the most technically advanced Puzzle Break in the world. During your hour long session, you will work together as a group to interpret clues and solve puzzles to successfully escape before time runs out. Escape the Rubicon is located in a designated room just outside Adventure Ocean complete with lighting and sound effects. This activity is available for a small fee of $8.99, and we think that it’s well worth the price. Get your thinking caps ready and be prepared to have some fun! 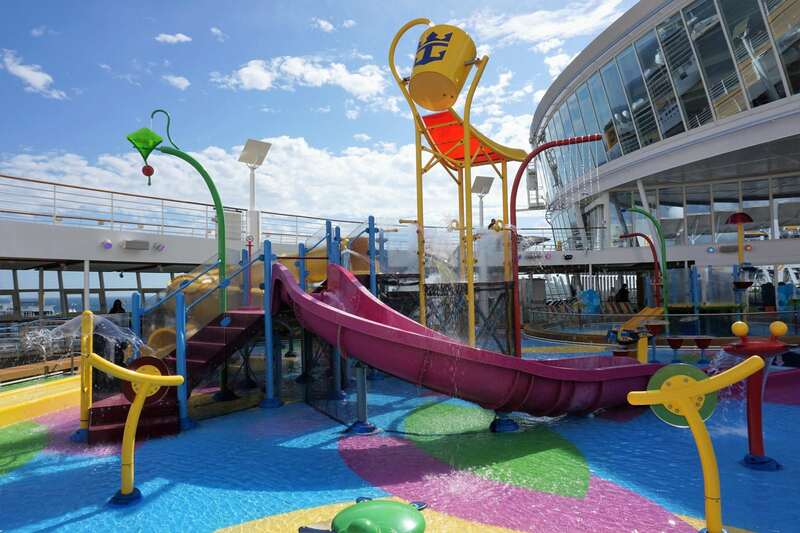 Following in suit with her older sisters, Harmony of the Seas also offers a zip line at sea. All the thrill seekers out there will certainly want to gear up and soar 9 stories above the Boardwalk on this one of a kind adventure. 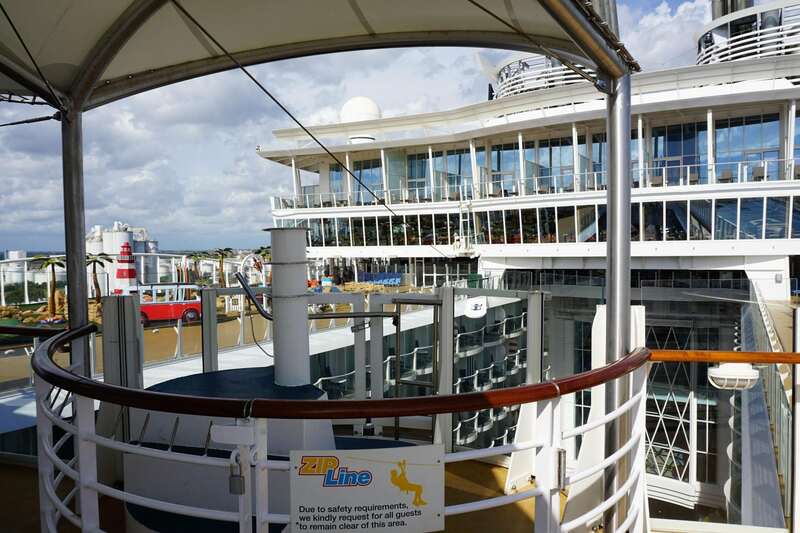 Earn some bragging rights by zip lining across the largest cruise ship in the world! Take in the sights, pose for a picture, or let out a scream; how will you choose to take flight? 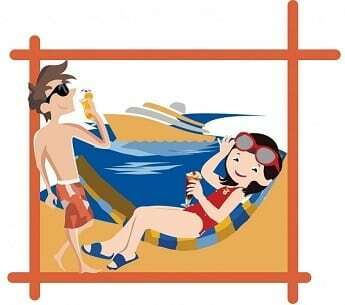 Remember that you will need to sign a waiver ahead of time, which can be completed on your stateroom television. 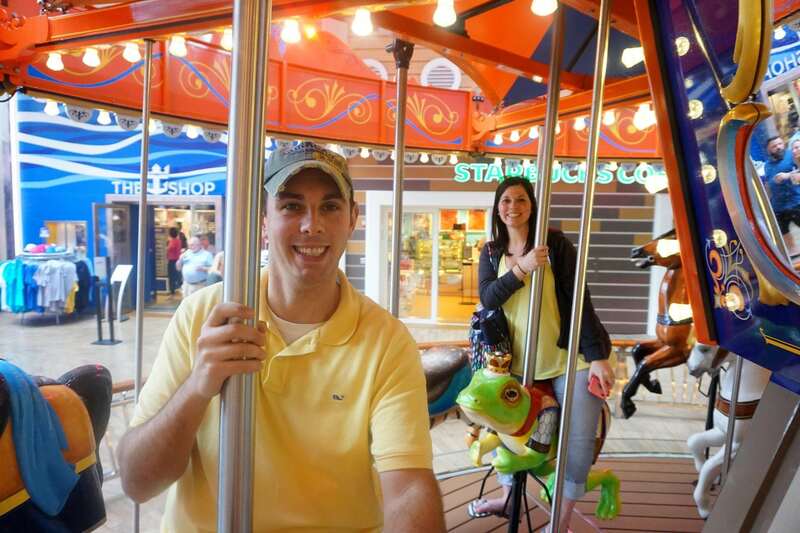 After the thrill of zip lining, why not keep the fun going by heading to the Boardwalk to take a spin on the carousel? This theme park styled attraction is fun for kids of any age from 2 to 92! So, pick your favorite hand-carved horse then sit back and enjoy the ride. Don’t forget to capture the moment by snapping a few selfies. 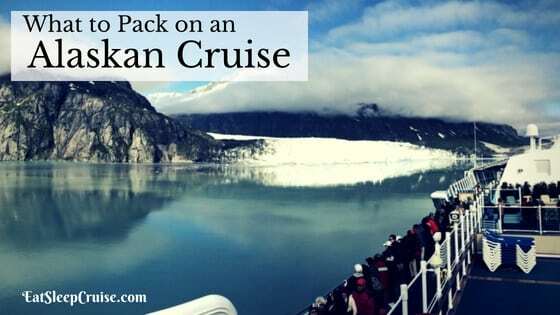 You will want to show your friends back home how much fun you are having on this largest cruise ship in the world. 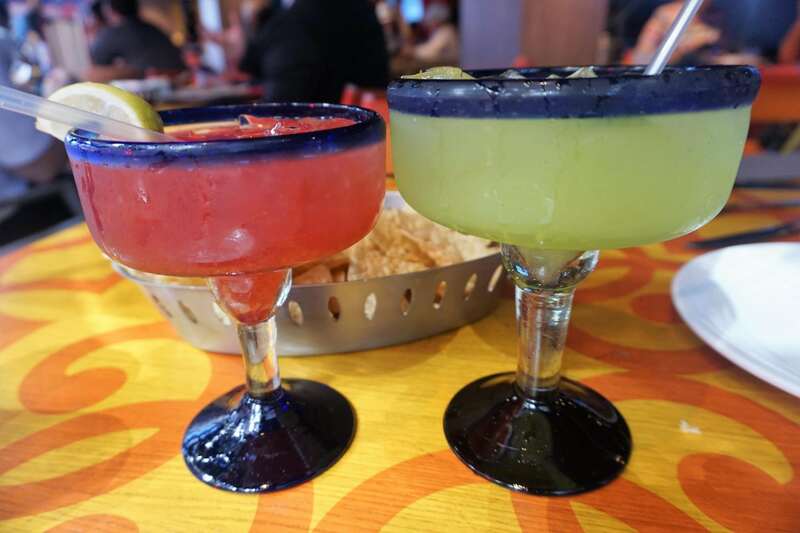 If all this activity has made you thirsty, make a pit stop at Sabor also located on the Boardwalk. This Mexican restaurant serves up some of the best handcrafted margaritas at sea. You can also munch on some chips and guacamole made table side or some a la carte snacks off the menu. This restaurant is a casual, open air venue that is great for people watching too. Sabor is open most days for lunch and dinner, so be sure to indulge here at least once during your cruise. 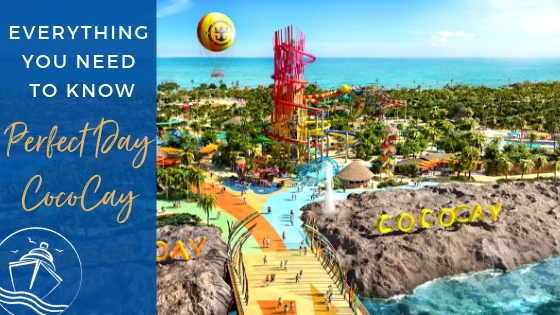 Splashaway Bay is the new and improved H2O Zone for kids on Harmony of the Seas. This adventure park for the little ones is sure to provide hours of fun with all the exciting elements including water cannons, a drench bucket, waterslides, and more. While the kids splash away in this thrilling aquapark, all you’ll have to do is supervise with a frozen cocktail in hand. After all, this is a vacation for you too. 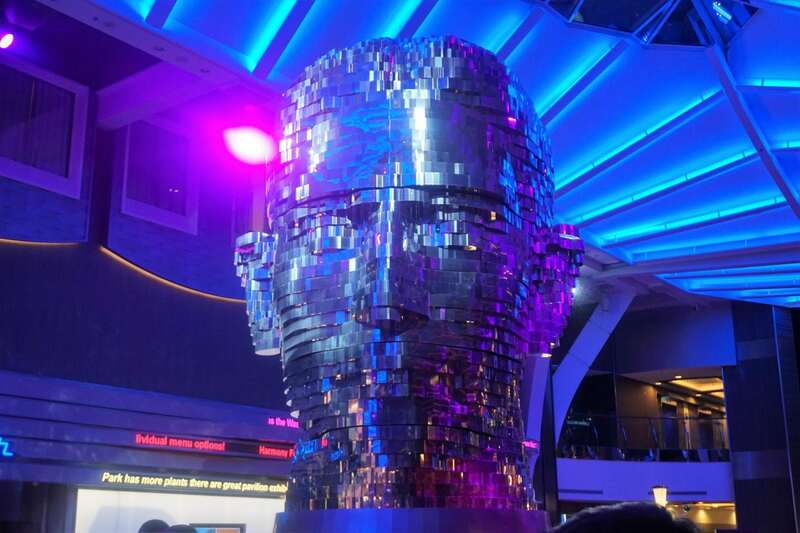 Harmony of the Seas boasts a 6.5 million dollar art collection comprised of 3,000 pieces of art from over 60 countries. This aptly titled art collection, The Wonder of Our World, The World We Live In, includes many spectacular one of a kind works including Head by David Cerny- this metallic smart art piece located in the center of the Promenade consists of moving steel plates that create an interactive three dimensional human head. 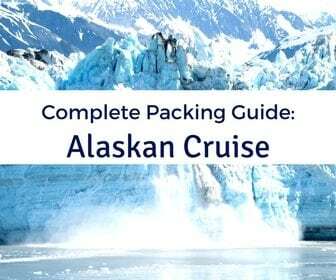 Inspect every nook and cranny of the ship to see how many of these works you can discover. Okay, it’s not really the Titanic, and you aren’t really Leonardo DiCaprio, but pretending for a moment is just as fun. 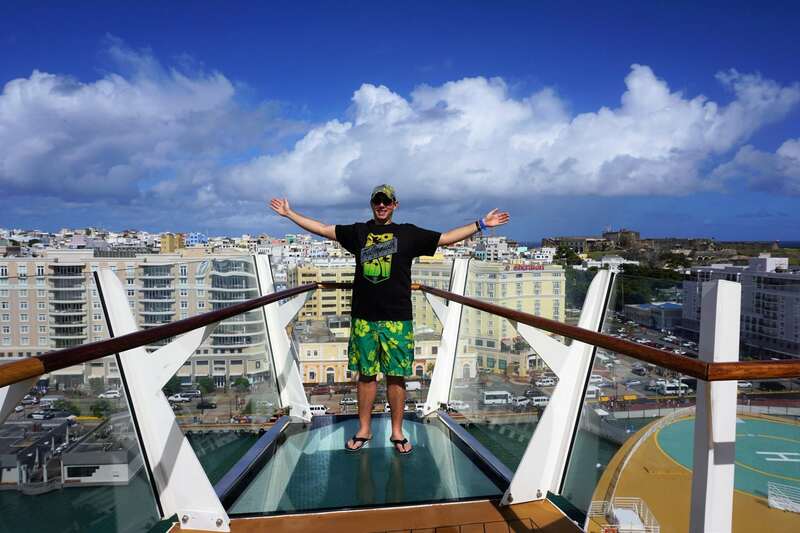 Head to the bridge wings located on deck 14, all the way forward off the Solarium, for amazing panoramic vistas. You will want to check out the view from both the port side and starboard side wings as they are different. The port side wing has a clear panel that allows you to gaze all the way down to the ocean. Nothing beats this view! 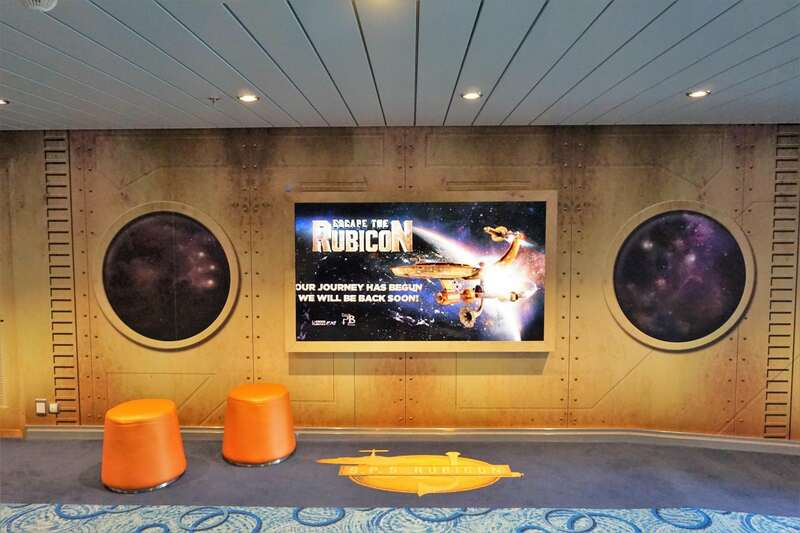 Speaking of kings, why not indulge in a bit of royalty on your Harmony of the Seas cruise? The Royal Suite Class available on Oasis class ships provides you with a bit of extra pampering and luxury when booking certain suite categories. 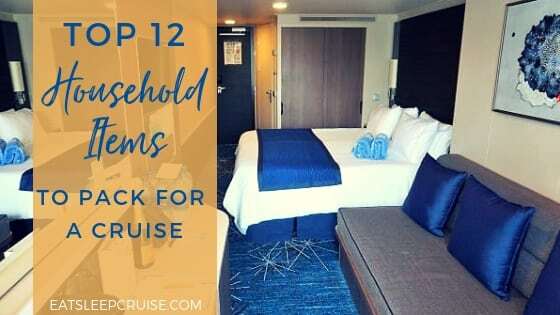 Depending on your room choice, you may be eligible for some “suite” perks including an exclusive restaurant (Coastal Kitchen), access to the Suite Sun Deck and Suite Lounge, priority seating at shows, and even a Royal Genie. Now that’s vacation! 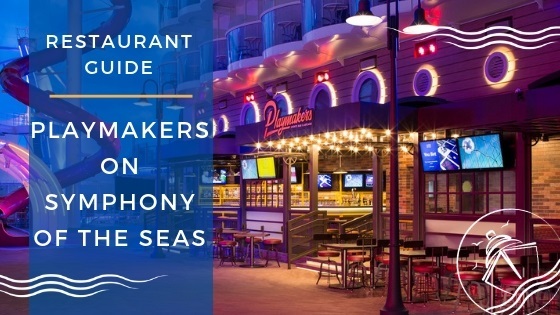 Grab some prime seats at Sorrento’s on the Royal Promenade to be in the center of the action for the Let’s Celebrate parade on Harmony of the Seas. This energetic performance gives you an excuse to celebrate…like you needed one? With every possible celebration combined into one hit party, how can it not be a great time? Commemorate your birthday, Halloween, the 4th of July, New Year’s Eve, and more all in one evening with this parade. Unfortunately, Santa Claus will not be making an appearance at the end of this parade. 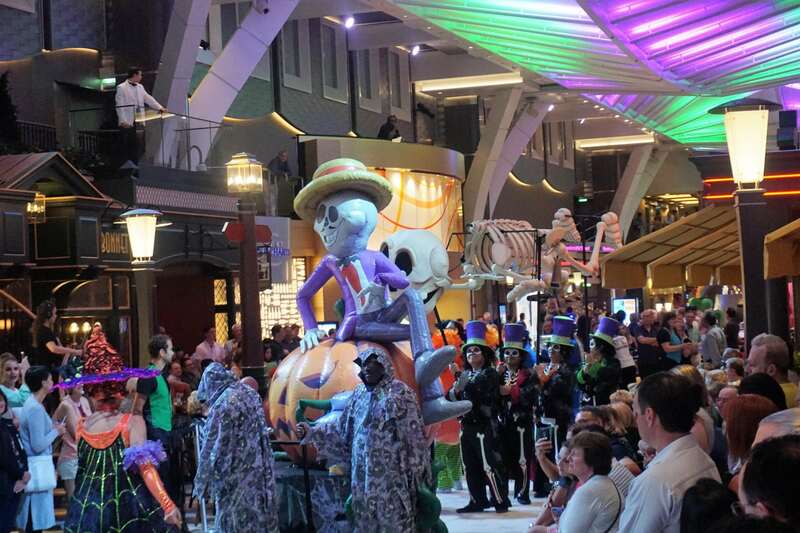 If the parades aren’t enough to get you dancing, there is plenty of other live music throughout the ship. Make your way to Boleros to get your Latin groove on, rock out to the live band in Dazzles, or dance it up in Studio B at the Red Party. 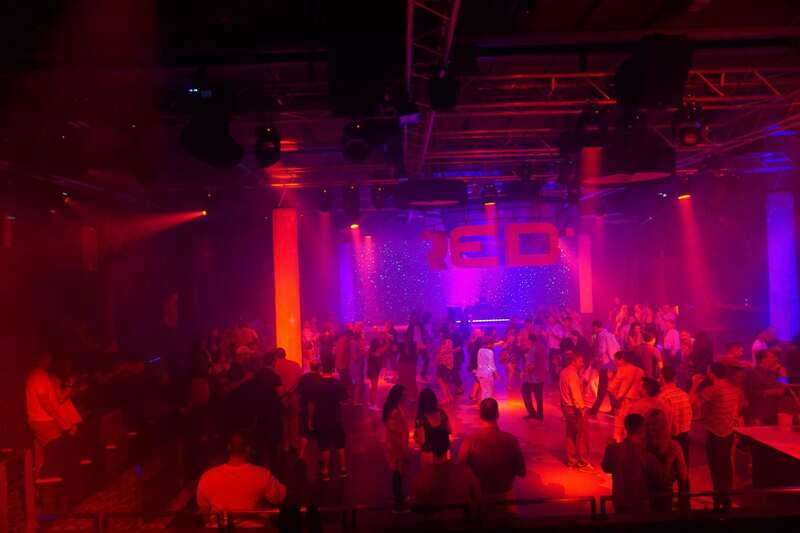 This unique party provides a night club like atmosphere with plenty of popular hits, lots of energy, and a few surprises along the way. Grab a partner and make your way to the dance floor on Harmony of the Seas. Make it your mission to track down the elusive Stowaway Piano player on Harmony of the Seas. 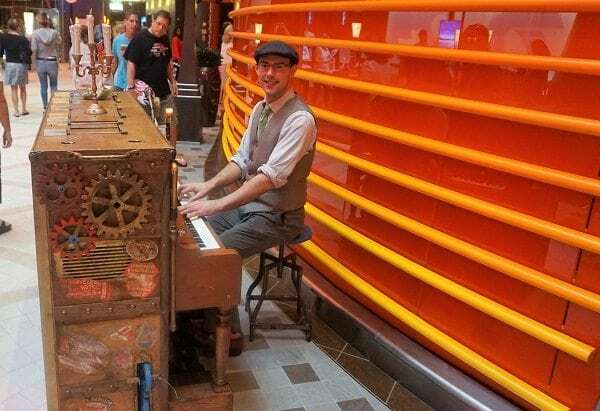 This piano player transports himself throughout the ship playing for guests in a street performer type style. You never know where he might show up- in an elevator, on the pool deck, or basically wherever you can fit a piano. 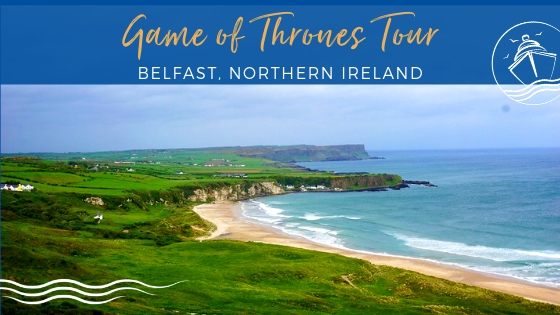 So, be on the lookout for yet another unique entertainment option onboard the newest and biggest cruise ship in the world. 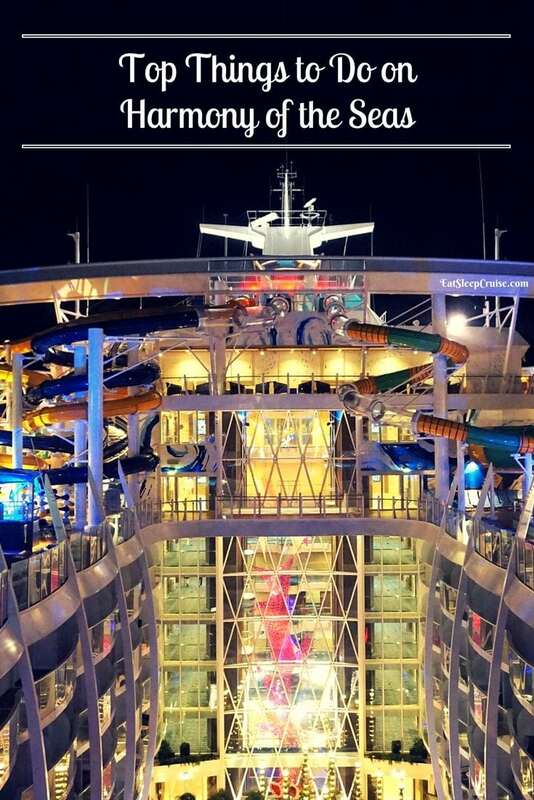 Have you sailed on Harmony of the Seas yet? 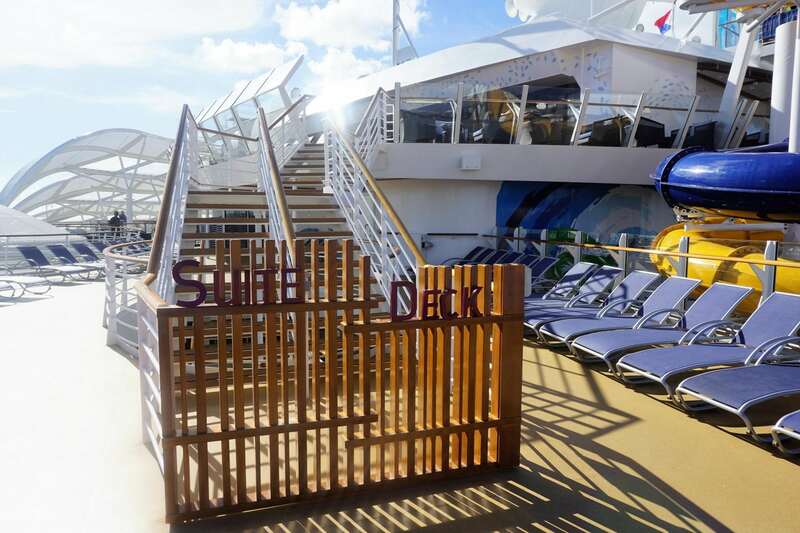 Did we miss any of your favorite things to do on this new and innovative ship? Drop us an anchor below to tell us about your experiences sailing on this latest mega-ship from Royal Caribbean. Hi, my wife and I will be on Harmony in September 2017. I the Red Party just the lighting, or do they encourage clothing that color as well? Like dressing for the 90’s party.